The MDX receives further refinements including enhanced interior trim for an even more stylish look. Three transformable rows of seats allow the MDX to seat up to seven passengers. A convenient walk-in feature provided at the curb side of MDX's second-row seat slides the seat forward with the touch of a lever. Second and third row seats split and fold flat into the floor providing 82 cubic feet of cargo room. The MDX's 3.5 liter, 24-valve, all-aluminum, VTEC(TM) V6 engine uses a high flow dual exhaust system that helps to generate 253 horsepower and 250 lbs-ft of torque. The MDX features a compact 5-speed automatic transmission with components engineered to provide the durability needed for on-road, off-road and towing use. 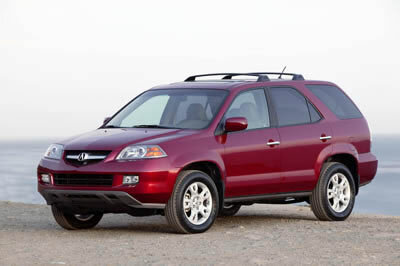 The MDX is one of the most comprehensively equipped vehicles in its class. Standard features including a power moonroof, multi-function digital trip computer, a synchronized climate control system, two rows of leather trimmed seats, premium sound system, heated front seats and steering wheel mounted cruise control and audio controls.